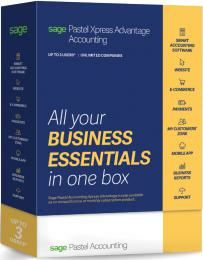 The Sage Pastel Xpress Start-up (V17) Accounting package suitable for to small to medium businesses with the need for only a Start up company and then later needs to upgrade to a multi set-s of books / companies. SPECIAL: Pastel Xpress Start-up V17 for only R2290 (Retail R2600) and SmartBank Bank Manager combined for ONLY a BARGAIN R4650 inclusive! SmartBank works beautifully on ALL Pastel Partner/Xpress versions with NO UPGRADE required saving over a thousand rand an more! Pastel Express Start-up V17 is a only a start up limited to 1 company and 1 user. Should you wish to upgrade to Pastel Xpress, single user and Multi Company, the cost of the upgrade is and extra R1400. There are NO other direct Extra Modules EXCEPT using the SmartBank Bank Manager is works beautifully with ALL versions of the Sage Pastel Xpress Start-up packages from V2007 to V2017! !